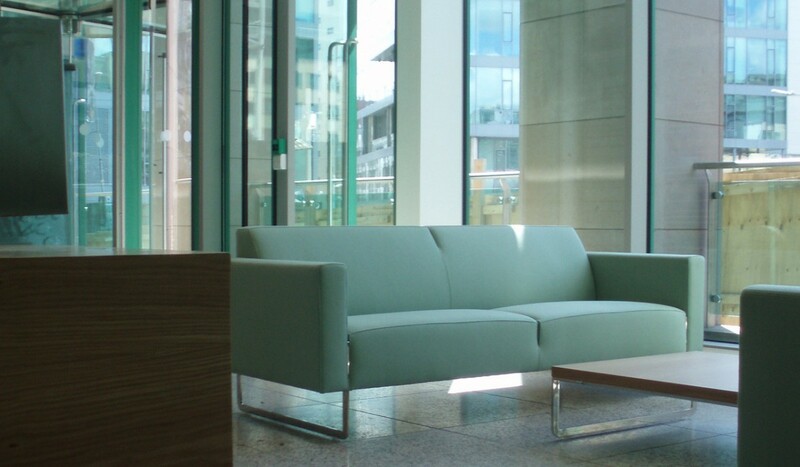 This project involved the upgrade of the design and finishes of the main entrance reception area of a recently constructed multi storey, multi tenant office building from a basic shell & core construction of painted plastered, walls etc to bespoke detail design interior finishes. The walls were clad in a combination of floor to ceiling glass panels with coordinated fine horizontal hardwood screening with subtle LED backlighting at top and bottom of each panel. The featured reception desk is constructed of textured kiln cast glass panels with stainless steel fittings and trims and hardwood veneered panelling.